Being bitten by a wild animal in the field is very rare. But if you are bitten and skin is broken, wash wound with soap and water. Apply pressure to control bleeding. If the attack was unprovoked, consider the possibility of rabies. Notify authorities as soon as possible. Seek medical attention if needed. If you are stung by a bee or wasp, remove the stinger, wash with soap and water, cover and keep clean, apply a cold pack for 15-20 minutes to reduce swelling. Relieve pain with aspirin or other pain reliever and relieve itching with a cortisone cream. Some people are very allergic to bee stings. Call 9-1-1 if the person has any trouble breathing or exhibits signs of anaphylaxis, such as swelling of the face throat or tongue, dizziness, a rash or hives, low blood pressure or shock. Many times individuals are aware of their allergy and carry an Epinephrine Auto Injector which is injected into the person’s outer thigh. Mild allergic reactions (moderate swelling) can be treated with antihistamines, such as Benadryl. The Centruroides vittatus scorpion is found throughout Texas and often under rocks or boards and other litter. Scorpions are active mostly at night. Similar to a bee sting, the sting from a scorpion causes pain and local swelling but usually is not serious except for rare instances of allergy for which medical attention should be sought. Centipedes have poison claws located directly under the jaws. Centipedes prefer moist or humid areas like basements and cellars. The House Centipede Scutigera coleopteran, lives primarily indoors and eats small insects. Their bite is similar to a bee sting, but because allergic reactions can occur, it is advised to consult medical care in the event of more serious symptoms. There are almost 900 species of spiders in Texas. Spiders eat insects and other arthropods and most are very beneficial. Tarantulas are common in Texas. Though they look scary and their bite can be painful, it is not deadly. Only 2 groups of spiders in Texas are considered poisonous to humans. 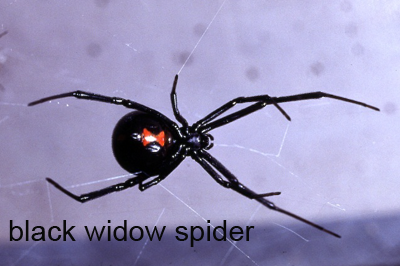 Black Widow spiders, Latrodectus mactans, are found all across the United States. It prefers protected cavities outdoors, often in portable toilets, abandoned sheds, cellars and other undisturbed places. It is the only shiny black spider (males and juveniles may show more color) and has a red hourglass pattern on the underside of its abdomen. Only the female is dangerous to humans. The bite feels like a pin prick or may not be felt. There may be slight local swelling and two faint red spots surrounded by local redness at the bite. Pain may become intense within one to three hours and may continue up to 48 hours. Pain usually localizes in the abdomen and back. There may be pain in the muscles and soles of the feet, and eyelids may become swollen. Other symptoms include nausea, profuse perspiration, tremors, labored breathing and speech, and vomiting. During this time, a feeble pulse, cold clammy skin, unconsciousness, convulsions and even death may result if the victim does not receive medical attention immediately. Additional complications may occur due to the infection of the bite. Bites are uncommon and serious long-term complications or death is rare. Those at most risk of serious reaction to Black Widow venom are small children and older persons. Seek immediate medical attention if bitten. So named for its shy nature, the Brown Recluse spider, Loxosceles recluse, tends to hide during the day and is most active at night. It lives in and around buildings in warm, dry places, like closets, barns, etc. Shake out shoes first before putting them on. It is small, between ¼ inch and ½ inch. Often called "the fiddleback" spider because of the design of a violin on its back between the eyes and the abdomen, the spider's venom causes death and decay of the tissue surrounding the site of the bite. The bite may not be felt immediately but pain can develop in the area after an hour or more. Seek immediate medical attention if bitten. Infected ticks can spread several diseases that can make humans very sick. 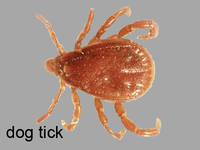 Rocky Mountain spotted fever can be spread by several ticks, including the dog tick and wood tick. Symptoms appear after 2 to 14 days after a bite and include: nausea, fever, vomiting, muscle aches or pain, severe headache and loss of appetite. Seek immediate medical attention. If left untreated Rock Mountain spotted fever can be life threatening. Treatment is usually with antibiotics and patients in most cases recover fully. Once rare, Lyme disease is spreading across the United States. 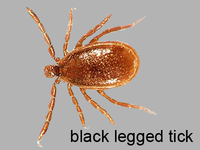 It is spread by the black legged tick and the deer tick. Signs of infection may appear within a few days or up to a few weeks after a bite. Usually a rash begins as a small red area around the bite and spreads. Sometimes there is no rash, but a bull’s eye target looking area may appear. Symptoms include fever, headache, weakness, and joint and muscle pain. Lyme disease can be difficult to diagnose and get worse if left untreated. Seek immediate medical attention if you think you may have Lyme disease. Early detection and treatment are keys to a full recovery. Antibiotics will be prescribed and are usually very effective. Some plants are poisonous or have poisonous fruit. Never eat any plant in the wild unless you are completely certain it is safe. Coming into contact with poisonous plants, such as poison ivy, poison sumac, or poison oak, can lead to very irritating rashes. If you come in contact with a poisonous plant, remove the exposed clothing and wash the affected area thoroughly with soap and water as soon as possible. Thoroughly wash clothing and your hands after handling them. Calamine lotions and antihistamines may help healing. If the condition worsens, seek medical attention.